Saturday, March 7, 1914: Nothing doing. Saw Mistress Ruth off on the train tonight. It was late, so I took the lantern down to act for a signal. Where was Grandma’s sister Ruth going? 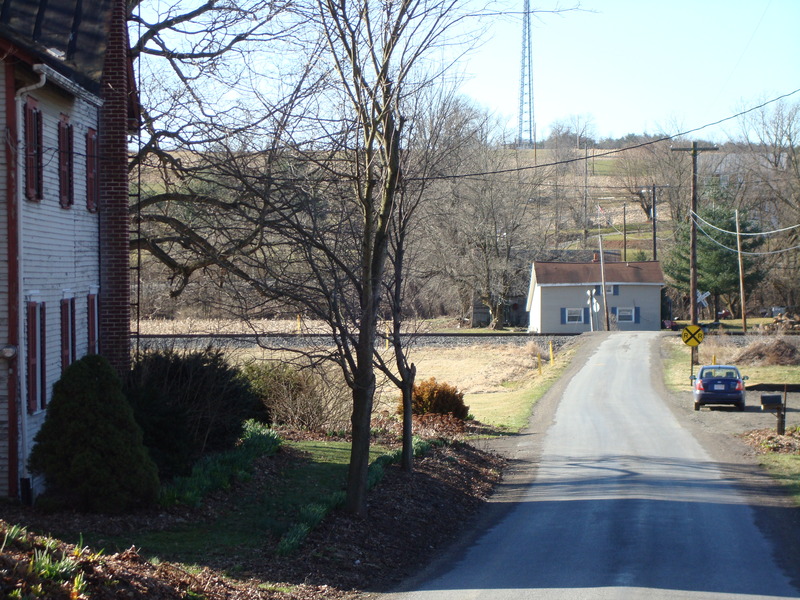 Tracks for the Susquehanna, Bloomsburg, and Berwick Railroad crossed the Muffly farm. There was a flag stop at a feed mill called Truckenmiller’s Mill which bordered the farm. The route went from Watsontown to McEwensville and Turbotville and then continued east to Washingtonville, Bloomsburg, and Berwick. 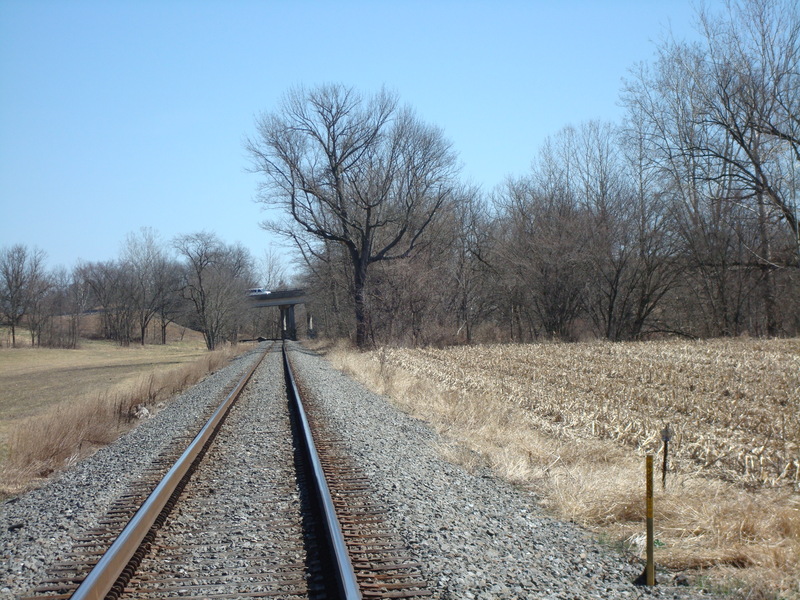 Recent photo of the railroad tracks that crossed the Muffly farm. Sometimes the diary entries give me powerful visual images. In my mind, I see two young women, standing beside a dark mill on a cold, cloudy moonless night waiting for the train. And, then the train lights appear in the distance. As the train approaches, Grandma wildly swings the lantern, while Ruth frets that the train might not stop. . . .but it slowly rolls to a stop and Ruth vanishes into the train. . . . and Grandma slowly walks home with the lantern lighting the way. Posted on March 7, 2014 March 6, 2014 by SherylPosted in OtherTagged family history, genealogy. Good description, I can see them together on the platform waiting in the cold as the train comes puffing into the station. Some of what Helena writes is so easy to relate to but this is SO different from what we experience today. It sounds dangerous and scary! Wow….so different from what we can even imagine in today’s world. Does it sound as though Grandma is “perturbed” that her sister is going somewhere: she called her “Mistress Ruth”!!! I can visualize it. Trains would stop almost anywhere. Quite different today. Such a different time…just stand by the train tracks and wave a lamp to make it stop. Wow. Oh for the days of the locals. When I was in grad school in Boston I was able to take the train all the way home to my little town of Forestvile, Connecticut (with stops along the way, of course.) I think that RR station is now a paint store. It sounds wonderful how there used to be passenger service to all the small towns. . . . sometimes I think that we’ve lost a really good form of transportation over the years. I love your visualization of this small moment. It really brings things to life to know the ordinary details of our ancestors lives. I love that she shared about flagging down the train with the lantern. I like your visual. I picture it that way too. I never realized you had to flag down your own train at some stops. Thanks for the nice note. It’s always wonderful to hear when someone enjoys this blog. . . And not need to apologize. I do the same thing all the time, and am honored that you mixed me up with Amy. You have a way of putting us there with grandma! The community is like a little time capsule. It just amazes me that you can walk to places in your grandma’s diary and using your imagination paint a picture of the event. I totally was right there with you.